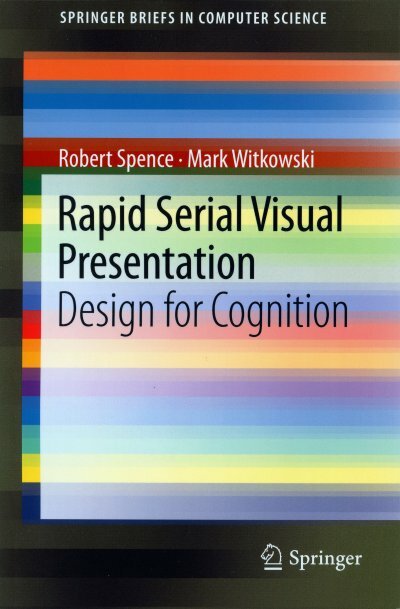 New Book - Rapid Serial Visual Presentation: Design for Cognition, (2013) Robert Spence and Mark Witkowski. Everything you need to know about how to present images quickly to maximise cognitive effectiveness. Published by Springer. Chapter 1: What is RSVP? And Why do I Need it? ; Ch.2: Experimental Evidence; Ch. 3:RSVP Mode and Their Properties; Ch. 4: Eye-gaze; Ch. 5: Analysing Gaze for RSVP; Ch.6: Design. Recent Proceedings - Advances in Autonomous Robotics (2012), Herrmann, G., Studley, M., Pearson, M., Conn, A., Melhuish, C., Witkowski, M., Kim, J.-H. and Vadakkepat, P. (Eds.) Joint Proceedings of the 13th Annual TAROS Conference and the 15th Annual FIRA RoboWorld Congress, Bristol, UK, August 20-23, 2012. From Springer LNCS (publishers page here). Robots Like Us - 27th November 2013 - As part of my work with the IET Robotics and Mechtronics Technical and Professional Network I'm organising the IET sponsored public lecture by Prof. Murray Shanahan (Imperial College London) at the London Science Museum. Murray will talk about his work in neuromodelling for robotics and artificial consciousness. The lecture is free, but requires registration (here). The lecture is co-located with the Science Museum Lates Event themed on robotics (free entry). The IET are also sponsoring short talks throughout the evening with Prof. Alan Winfield (robot ethics), Dr. Sunny Bains (robots and the media) and Dr. Nick Hawes (intelligent autonomy). Free and no pre-booking is required to attend these short talks. TAROS-2014 - the 15th Towards Autonomous Robotics Systems - late August 2014 at the University of Birmingham, UK. The 15th Towards Autonomous Robotics Systems Conference will again include an Industry Day to foster and strengthen links between academia and industry. TAROS-13 was held in Oxford. Imperial Fringe, "Your Number's Up" Thursday 31st October. James Mardell and I were there talking about James' work on perception for Wilderness Search and Rescue and inviting visitors to try our "change blindness" test - illustrating that, rather perversely, really obvious things can remain hidden while in plain sight. More details about the Fringe here. Watch the introductory rolling video here, and some photos from the event here. 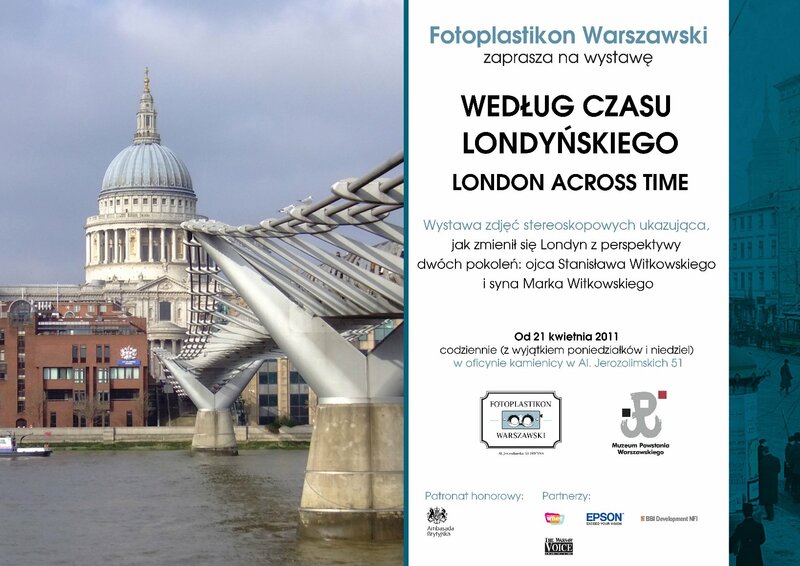 "London Across Time" (Według Czasu Londyńskiego): an exhibition of stereo (3D) photographs at the Warsaw Fotoplastikon, showing how London has changed since the 1960s. This exhibition of 48 stereographs combined and contrasted stereo photographs taken by my father Stanisław Witkowski in the late 1960s, with modern stereo photographs by myself to show a changing and changed city between the two generations. The exhibition ran from 21st April 2011, see the poster here (in English, in Polish). More details here. The Warsaw Fotoplastikon (Stereoscope) is an authentic late 19th century viewing machine for stereoscopic images, fully functional and operating today on its original site in central Warsaw. The Fotoplastikon is part exhibition space, part museum and part tourist attraction, and holds regular exhibitions of modern and historical stereo photographs. Well worth a visit whenever in Warsaw! My continuing research goal is to consolidate the work described below on various aspects of perception, attention, awareness, planning, learning, behaviour generation and reasoning into a unified model for application to robotic controller design. I have taken as one of my conceptual starting points Igor Aleksander's "Five Axioms" (sense of presence, imagination, attention, planning and emotion), while recognising that they will alone not be sufficient to realise human level machine awareness and activity, they are each almost certainly necessary to achieve it. Whereas Aleksander's axioms are concerned with high-level description, my primary concern is with underlying principles of operation necessary to support these diverse observables. Unsurprisingly, I'm not expecting immediate results, but the journey is filled with endless fascination. In the meanwhile I am collaborating with Prof. Bob Spence and James Mardell in the Circuits and Systems Group at Imperial College London on aspects of Human-Computer interface. We are looking at visual inspection for simulated search and rescue tasks and aspects of the human attentional system. We've also been looking at eyegaze contingent control of large image space, with Nick Adams, who developed and thoroughly investigated a very elegant user interface strategy for "hands-free" navigation of Google Earth just by looking at the screen. This work was awarded the HCI 08 Award for International Excellence. You can find this and a list of selected publications here. I am also a Visiting Fellow at the Bristol Robotics Laboratory, and I am working with the team there to investigate aspects of Human-Robot Interaction in the context of safe robot operation when in close proximity to humans. I have recently worked on understanding intentionality and threat space in a tactical environment with Prof. Erol Gelenbe's Intelligent Systems and Networks group and with Prof. Panos Louvieris (Brunel University) on decision support methodologies in an adversarial context, both part of the UK Defence Technology Centre/Data Information Fusion Initiative (DTC). I have worked with Murray Shanahan in his Cognitive Robotics group, with Dr. David Randell on formal representations for robot planning, sensory interpretation, perception and attention. Our most recent, completed, EPSRC project "Abductive Robot Perception: Modelling Granularity and Attention in Euclidean Representational Space" takes an abductive (reasoning from observations to postulated causes) reasoning approach to active perception for robotics. Key results from this work include a formal view of the perception process and a consolidation of multiple aspects of attention and awareness in this formalised view. Perception is taken as a combination of bottom-up sense driven and top-down hypothesis driven activities. Features extracted from the robot sensors indicate explanatory hypotheses in the bottom-up phase. Subsequently, the deductive consequences of each of (the many, possibly competing) hypotheses are used to disambiguate between alternative interpretations of the sense data to provide an explanation of that data. This project used our upper torso humanoid robot Ludwig. Our previous projects in the Imperial College Cognitive Robotics series have been Spatial Reasoning and Perception in a Humanoid Robot, Cognitive Robotics II and Cognitive Robotics I, which investigated the use of combines Shanahan's existing Event Calculus formalism in an abductive framework to investigate a range of topics in robot sensor data assimilation, planning and action selection. My on-going research interests include the simulation and understanding of natural Behaviour through anticipatory learning methods and associated action selection strategies. My latest paper on these issues "An Action Selection Calculus" is in the Adaptive Behavior Journal. These are a continuation of earlier work on the "Dynamic Expectancy Theory", which integrates innate reactive (pre-programmed or evolved) behaviours with goal-directed learned behaviour to address the action selection problem. Learning in the Dynamic Expectancy Model is accomplished by an ingenious variant of the reinforcement learning method in which expectancies about the environment ("micro-hypotheses") are created and corroborated (by "micro-experiments") by a predictive method which dispenses with the need for the provision of external reward to drive learning. Motivation and learning are separated and learning may take place latently, independently of any known or assumed goal. The system generates reactive goal-directed behaviours by formulating a "dynamic policy map" from stored micro-hypotheses when goals arise. Previous research and commercial interests have been in robotics, industrial local area networking, expert systems for dentistry and system configuration, and methodologies for manufacturing systems and product design. I am also a director of AIQ Limited, which offers design and consultancy services in these and related areas. TAROS-13 will be in Birmingham 31st August to 2nd September, with a special industry day on the 2nd of September. I was local organisation chair for Towards Autonomous Robotics Conference (TAROS-05) at Imperial College in September 2005 (on-line archive), chair of the programme committee for TAROS-06 (proceedings, large file) held at Surrey University in September 2006, and conference co-chair for TAROS-07 held in Aberystwyth in September 2007 and TAROS-08 in Edinburgh, 1-3 September 2008. TAROS-09 in Ulster 31 August to 2 September 2009. TAROS-10 was in Plymouth. Please contact me by e-mail at the Department.